All suspected study outcome events were assessed by a central, independent adjudication committee whose members were unaware of the group assignments and who reviewed the imaging results. The primary efficacy analysis, which considered all outcome events occurring from randomization to the end of the study, was performed according to a modified intention-to-treat principle, with all patients who received at least one dose of the assigned study drug after randomization included in the analysis. Assuming a 40% relative risk reduction with aspirin, 8-11 a total of 70 events would provide a power of 80% to show the superiority of aspirin over placebo at a two-sided alpha level of 0.05. With an expected event rate of 8.0% per year in the placebo group, we calculated that we would need to enroll 400 patients (200 in each study group) to observe the expected number of events. ●One multicenter trial (WARFASA) randomly assigned 402 patients with a first episode of unprovoked VTE who were treated with 6 to 18 months of warfarin therapy to receive aspirin or placebo for an additional two years . Aspirin was associated with a 40 percent reduction in the rate of recurrent VTE (7 versus 11 percent/year; HR 0.58; 95% CI 0.36-0.93). Bleeding rates were low and similar between the groups (0.3 percent per patient-year). ●In another trial (ASPIRE) of 822 patients, most of whom had received anticoagulation for 6 to 12 months for a first episode of unprovoked VTE, compared with placebo, aspirin was associated with a reduction in VTE recurrence over a four year period that was NOT statistically significant (5 versus 7 percent per year) . The rates of bleeding and serious adverse events were similar. 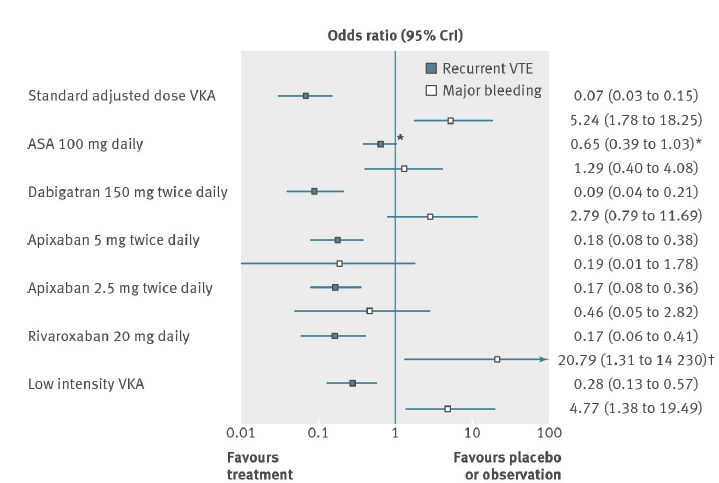 ●A prospectively planned combined analysis of the WARFASA and ASPIRE trials reported that aspirin, as compared with placebo, significantly reduced the rate of VTE recurrence by 32 percent (HR 0.68; 95% CI 0.51-0.90) with no excess risk of bleeding [30,31]. 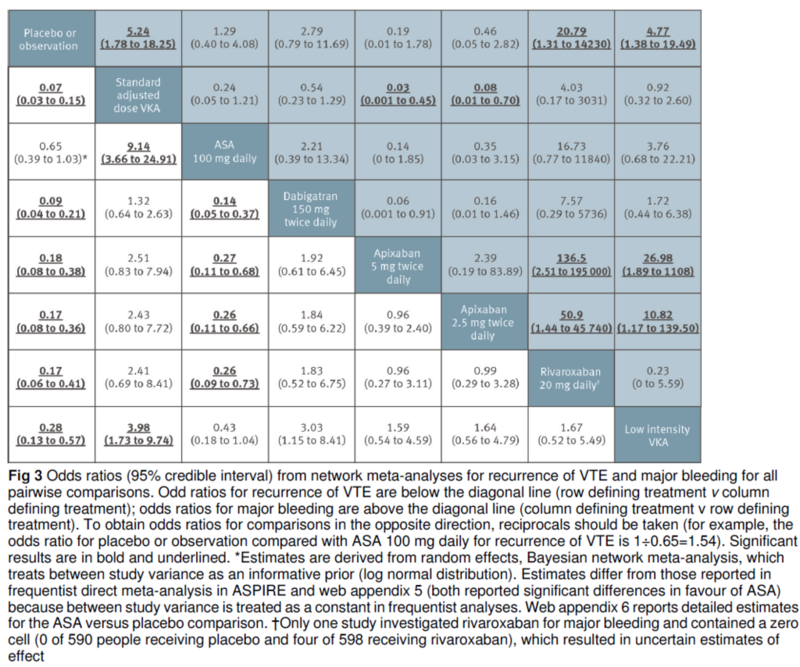 ●In a meta-analysis of 12 trials (12,000 patients), aspirin was associated with a 30 percent risk reduction in VTE recurrence when compared with placebo or observation .